Live an unforgettable 6-day climbing program together with the local and IFMGA mountain guide Marco. 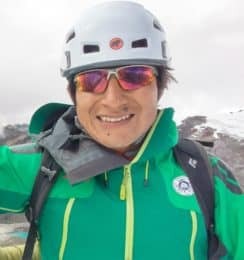 He'll help you reach the summit of the Nevado Huascaran, the highest peak of Perú. Today I bring a big plan for you. 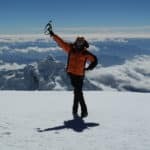 Climb with me the Nevado Huascaran and conquer its 6768-meter summit. It will be a memorable week in which I will help you overcome your own limits! As you may know, the Nevado Huascaran is the highest peak in Peru. Lying inside the Huascaran National Park, this mountain is also part of the Cordillera Blanca. Moreover, it offers a challenging ascent and a different option for those climbers in search of a really high summit. If you want to enjoy this program to the fullest, keep in mind you’ll need a good acclimatization. That is why we’ll reach the Huascaran summit after 4 days of preparation. Besides that, it’s good to mention that you can do a better warm up in the Santa Cruz valley. It’s a program I also offer and you can check it out here. 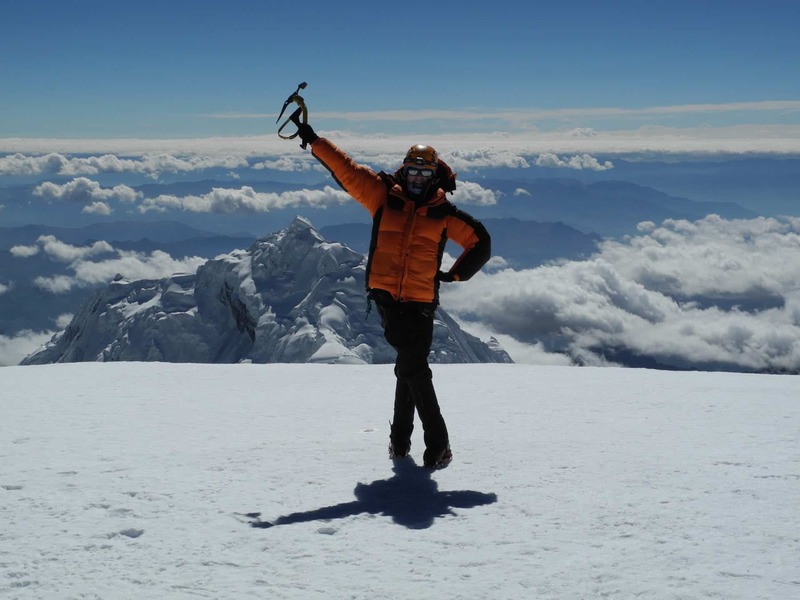 The best season to climb the Huascaran peak is during the Andean winter, from May till August. I will lead a group of 2 people maximum. If you are more than 3 I will ask a colleague to assist us. So, what are you waiting for? Get in touch with me now, ask me all your doubts and book your place. It’s an experience you won’t forget in your life! After breakfast in the hotel we will start at 7 AM driving along the Callejon de Huaylas to Musho. Here the Donkey Driver will be waiting for us to transport our climbing equipment to the Huascaran Base Camp (3800 m). Time to hike for about 4 or 5 hours until we’ll be also in the Base Camp. After breakfast we will start hiking to the moraine camp, with some sections of rock climbing. After 3 hours we’ll get to the glacier, from where we will start climbing to the Camp 1 at 5000 meters of altitude. Overnight camp there. The day starts at 4 AM since we must climb to the Camp 2 for about 6 hours. Finally, we will arrive at Camp 1 at 5950 meters above sea level. Overnight stay there. 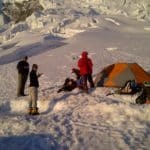 After breakfast in the Camp 2, we will start climbing at 3 AM. Along this route we will enjoy the nice views of different mountains. 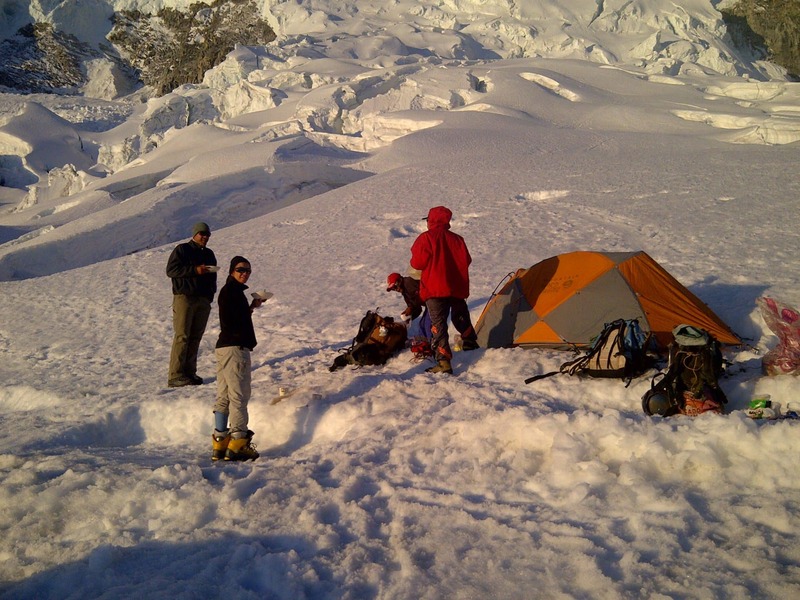 We’ll also have the opportunity to see the sunrise in the Cordillera Blanca. We’ll finally get to the summit by 10 AM. Once up there you will enjoy the snow-capped peaks and take some pictures. Time to return to the Camp 2. The descent will take 4 hours approximately, arriving to the Camp 2 by 4 PM. We’ll spend the night there. Early in the morning we will start going down to the Base Camp for 2 hours. We’ll have lunch in the Moraine Camp so we can continue down to the Base Camp. Overnight in the Base Camp at 3800 m.
After our last breakfast we will walk downhill to Musho for about 3:30 hours. Here our private transport will be waiting for us to take us back Huaraz. Once in Huaraz you’ll be taken to your hotel. End of the program.